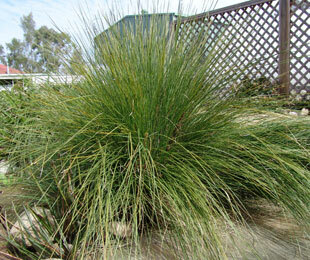 Description: Wingarra® Lomandra has large deep rhizomes, making it tougher than other confertifolia types. It has fine textured, blue-green foliage and a compact clumping form. Small yellow flowers appear from September to November. 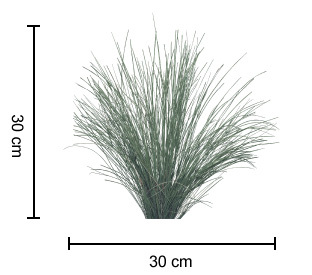 Like all confertifolia’s, Wingarra® Lomandra is slightly slower to establish than other Lomandras, a higher planting rate or larger pot sizes are recommended for cooler climates. Size: 30 cm high x 30 cm wide. Uses: Mass planting or border planting. Position: Full sun to part shade. Tolerates humidity, drought and frost. 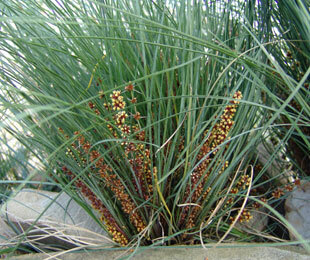 Wingarra® Lomandra suits sandy, sandy loam to clay soils. Care: Water as required for 8-13 weeks until established. Occasional watering may be required for dry inland regions, WA and SA. Plant in a well mulched garden (chunky mulch is recommended). For best performance ensure crown or base of plant is not below soil or mulch level. If required use slow release fertiliser in spring. Every 3-4 years cut back 15cm above the ground if required. Where it works: NSW, ACT, VIC, TAS, SA, WA & QLD (only for non-humid regions like Toowoomba). 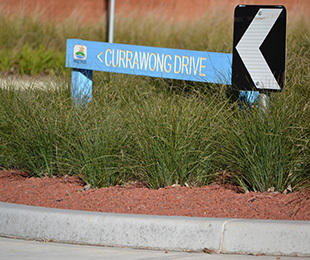 For more detailed information on Wingarra® Lomandra click here.